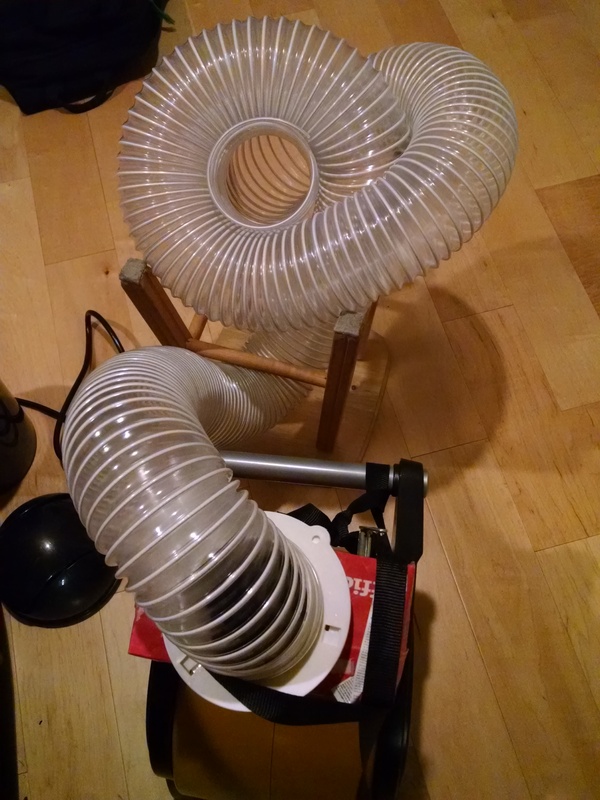 We bought a ten-foot long flexible ventilation hose The challenge was: how do we connect this round hose to the oblong opening on the fan? We built a couple of boxes from cardboard and cut door flaps in them where you can push a scarf in. These were more fun for kids, because it focuses the air, so scarves shoot a little higher. And check out what happens when we sent a little plastic “bowling ball” through the door. We mounted a poster tube through the box. 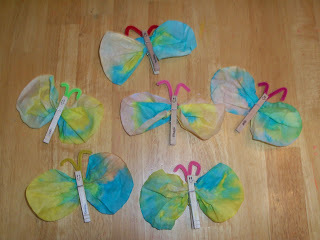 You could stuff scarves into a tube, hold your hand over one end, then let go, and they’d shoot into the air. You could shoot a lightweight ball too – like a cannon ball. Then it was time to figure out how to attach the hose to the box. We tried taping the hose to the box but that didn’t work. So, I bought a hose connector for the end of the hose, figuring we could attach that more easily. Then we assembled it. Put the cardboard box over the fan, mounted the hose on the box, and we were good to go. When I tested this at home, with just one child, it worked great. We had a fabulous time with it, shooting scarves into the air, shooting balls so they rolled across the floor for the dog to chase, shooting balls into a box for improvised “golf” game. Tons of fun for both of us. But, then my husband tested it in a class full of kids. The first problem was that it kept falling apart. The fan tilts in its base, and if you tilt it too far, it pushes the cardboard box right off. (I may have forgotten to warn my husband about this issue… ) When kids put their hands in and pulled them out quickly, that pulled the cardboard box off quickly. Just the weight of the hose could pull the box off. So, there was a lot of work involved in just keeping it together, and the kids weren’t that excited by the results even when it worked. So, before the next time we’d use it in class, we did some tinkering. We used a ratchet strap to hold the hose onto the box and the box onto the fan. 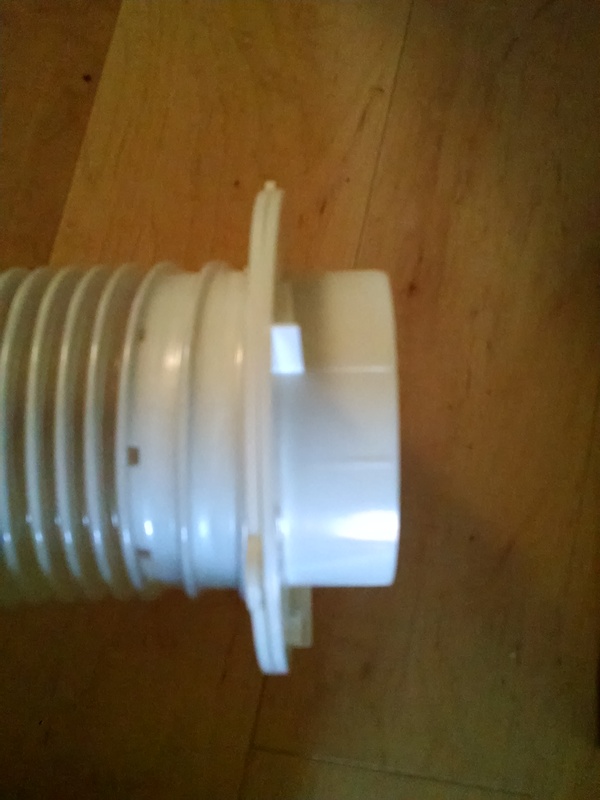 We turned it so the hose fed off the other side of the fan, over the handle, which helped to stabilize the box. This solved the falling apart problem. We had discovered that kids like it better when the scarves shoot vertically up into the air instead of shooting out horizontally, so we wove the hose through the legs of a stool to get that upward angle. Check out the video at the top of this post to see the scarf cannon in action. We took it back to class, and this time, we had a hit on our hands! Lots of kids loved feeding through scarves, and balls.. We discovered that kids liked it even better when we set the stool up on top of the cubbies, so the scarves were shooting out from 4′ up in the air. The three biggest fans of this toy were a team of a 5 year old boy and a 4 year old boy, and a 2.3 year old girl. They discovered that if you sent through a balloon that was just the right size, it makes a really funny rumbly noise. The little girl was just as successful at using this invention as the older kids. She clearly learned from them. The boys had been having fun catching the scarves in a bin as they floated down toward the ground. When they walked away for awhile, she picked up the bin and tried to catch the scarves. In our Inventors class, we are encouraging kids to tinker, and try things they’ve never done before. We tell them to build something, test it, re-build it, and so on. I am intentionally doing the same thing as I design activities for the class. Experimenting, failing, and trying again. This scarf cannon is still a work in progress, but it’s definitely a fun exploration! 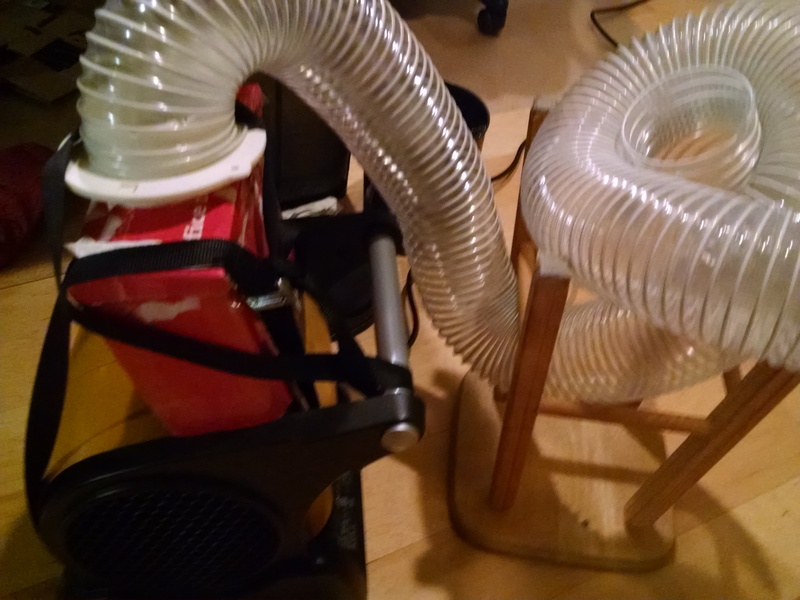 You can also check out my experiments with building a wind tube, a marble run, and a water wall. 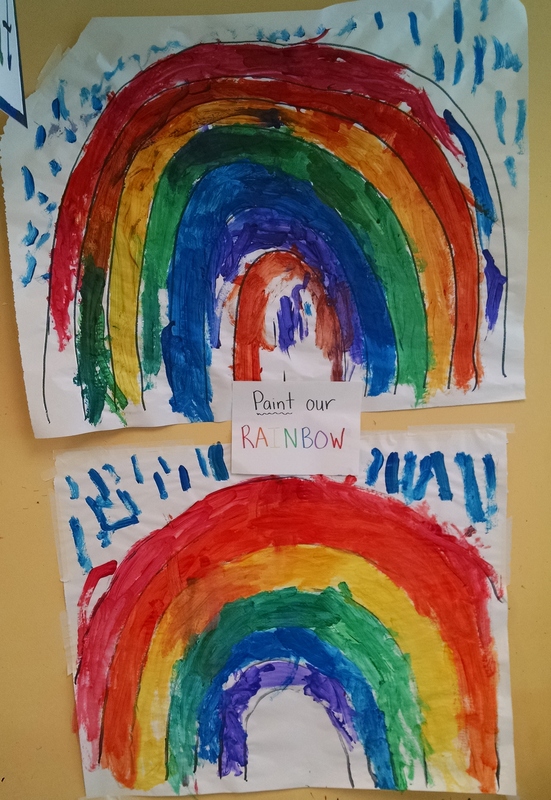 This entry was posted in For Educators, Inventors of Tomorrow series and tagged children's museum, maker, preschool, science, tinker on September 22, 2015 by Janelle Durham. 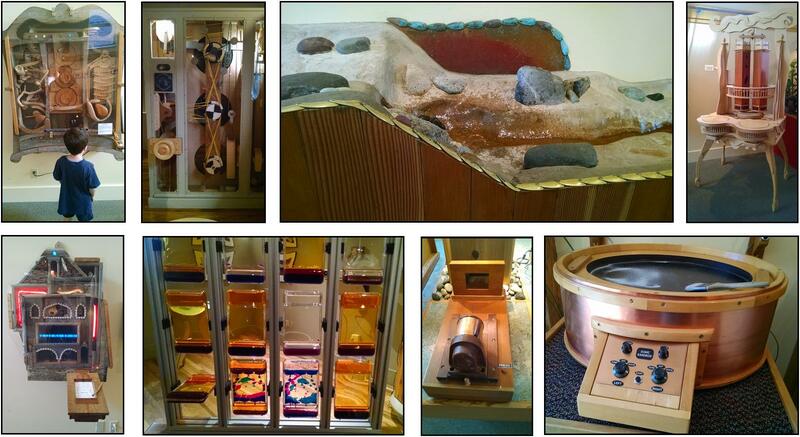 In Bellingham, WA, there’s a fascinating place called Mindport. It’s a little like an art gallery full of beautifully crafted exhibits… but unlike art galleries, you get to touch and interact with everything! It’s a little like a children’s museum where children are welcomed and can explore and play with everything… but the exhibits are intriguing enough that all the adults in the room were as engaged as the kids. It’s like a science museum with exhibits that illustrate scientific concepts – and binders that explain the details… but it’s prettier, and somehow more soothing and meditative, than any science museum I’ve been in. MINDPORT (mind port) n.: 1. a museum of phenomena; 2.) a provocative blend of art and interactive exhibits; 3.) a place to spark your awareness and stimulate your thinking; 4.) a place to play and to observe. Before going to Mindport, I read a review that said “everything about them is amazing… except their website.” I have to agree. The website only includes brief descriptions of a few of the exhibits, and a brief description of “what are we” is buried way down in the blog archives. Not enough to give you a good sense of what to expect. So, I’m going to give some detailed descriptions here of the experience and some of the exhibits, then offer a few more photos as “teasers” of what else you’ll discover here. Mindport is in downtown Bellingham, WA. It’s in a retail storefront space, about the size of two typical stores, so not huge. Admission is only $2. There are lots of restaurants and other museums within walking distance. It was fairly busy for the first hour or two we were there (on July 3), but never crowded and never loud. By the end of our time there (mid-afternoon), we were the only family, and had some nice chats with a very friendly and helpful docent, and our son got to play the pipe organ, which they ask that only skilled musicians play when it’s crowded, as you can hear it throughout the museum. The first exhibit we came to (#1 in the photos above) was the deep sea divers. Pump a hand bulb and plastic divers descend down the tube toward you. Stop pumping, and they pop back up to the surface. Our four year old had a hard time pumping effectively, but a 6 year old did great. They both liked seeing the divers come down. 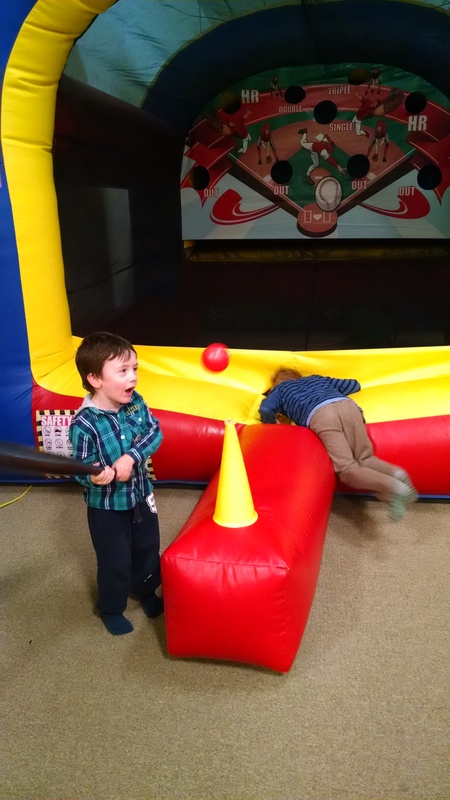 They had a ball wall (#2). 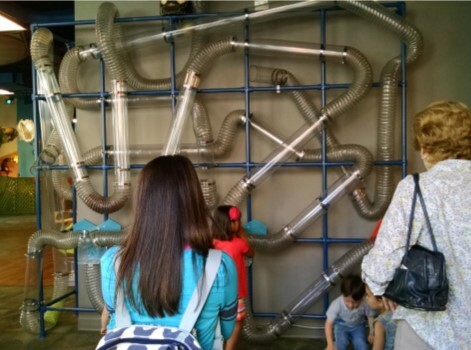 As people who frequent children’s museums and science museums across the country, we are connoisseurs of ball walls, also known as marble runs. (For ideas on how to build your own, check out my post here.) I really liked this peg board system, and all the different sizes of tracks available (notice the rack to the left with all the tracks organized and ready to use.) It was very adjustable and we found lots of fun ways to build it then re-engineer it. (Which is why I love ball walls. 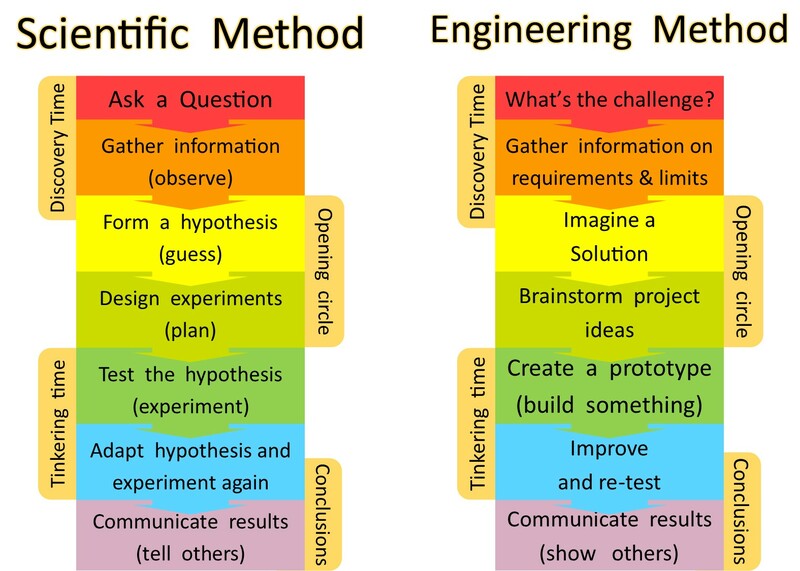 I think they’re a fabulous way to teach your child the engineering method: build something – test it – adjust it so it works – test it – adjust it again to make it even better – test it again. Read my post here on how willingness to fail and try again is a key to success.) Only downside – they only had three marbles. I understand not having too many, because then kids don’t chase them down when they escape the ball run and other people step on them. But 5 would be nice so me and a couple kids could play at the same time. #4 is the Diabalique, a table that you tilt side to side to run balls through a maze. Read a short article on it here, or watch the “Making of” video. #5 is “Burl Ives”, a piece of burl wood that when you rock it gently from side to side, it plays musical tones. So hard to explain – I wish I’d made a video, but very intriguing to play with, probably even more so for a very musically oriented person. This video shows a marble elevator. You turn the crank and the marbles go uphill, then roll down ramps. Like so many other exhibits, this and the compass exhibit show the melding between beautiful art – their woodworking is fabulous – and interactive experience. They do have plenty of art on the walls, like GIANT TASKS / tiny people, which are quite nice. I’m a very kinesthetic, non-visual person, so I confess that I spent more time with the hands-on interactive items. There’s also a picture with colored glass tiles in it, which again is lovely enough, but a little dull. But the video shows what happens when you wave a hand in front of it. There are more details about some of their exhibits in their blog archives: http://mindportexhibits.blogspot.com/, which also include some interesting long articles on the nature of things like science education (STEAHM… putting the Arts and Humanities into STEP education) and insights into the training and mindset of a tinkerer / inventor / maker: director Kevin Jones. I enjoyed the place so much, I wanted to give them more money on the way out, but they didn’t have a donations box. When I got home, I looked at their website for a “donate here” button, but they didn’t have one. I did find a note in their blog archives that they are not a registered non-profit. But I would still be happy to contribute more to their work, and would suggest that they offer an easy opportunity to pay more than $2. I don’t know how many people would do it, but there’s probably other “crazy” people like me who would. MIndport doesn’t open till noon on Fridays (and isn’t open at all on Mondays and Tuesdays, FYI), so we had a lunch beforehand at Mount Bakery a block away. The brie, apple, and pear crepe was fabulous, and they had great service. Our waitress saw that our son was really hungry, and brought his food out early, but held it up high where he couldn’t see and mouthed to us: “OK to give this to him now?” I appreciated having the chance to give the idea a thumbs up. After Mindport, we stopped by the Comics Place, across the street, and picked up a comic book for our son to read in the car on the way home. There’s also lots of used book stores nearby, if you prefer. On our next road trip to Bellingham, we look forward to a quiet morning exploring the FIG (Family Interactive Gallery) at Whatcom Museum, then a loud and exciting afternoon at the MegaZapper electrical show at the Spark Museum of Electrical Invention – only held on Saturdays and Sundays. (We LOVE the Theater of Electricity at the Boston Museum of Science.) We also plan to return to Mindport someday – I want to play with the ball wall some more! 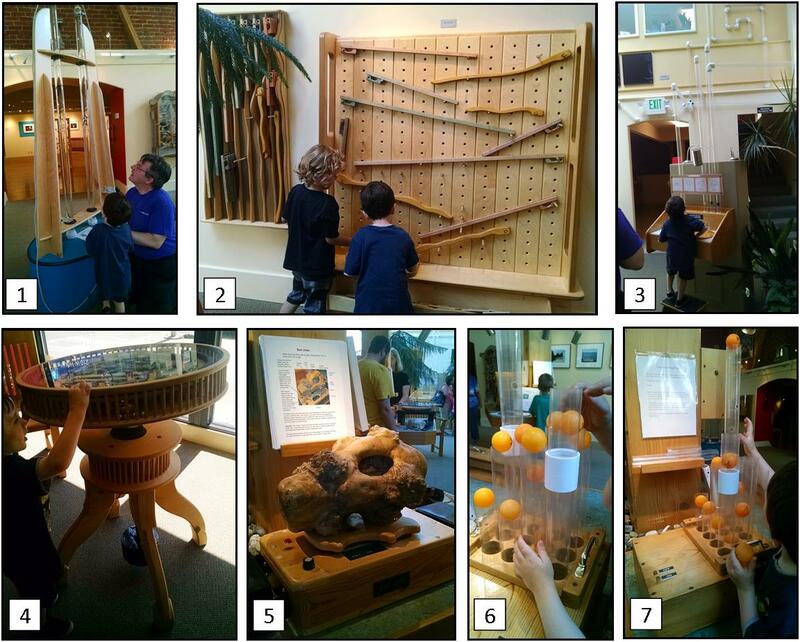 This entry was posted in Inventors of Tomorrow series, Play and Fun Activities, Seattle area and tagged bellingham, children's museum, kid, mindport, museum, preschool, Seattle daytrip on July 6, 2015 by Janelle Durham. Looking at Leaves. The instructor had collected 25 leaves, and given us each one. She asked us to look at our leaves and memorize them. You could ask children to think about how to describe their leaf: shape, color, texture, and so on. Then we put them all in a pile and mixed them up, then had to find our own. Simple, free, and great for teaching attention to detail, visual discrimination, and short-term memory. Easy to customize to age group, or to start a year with leaves that are very easy to tell apart, and over the course of time, have collections with more subtle differences. After the leaf match, you could take them outdoors to find the plant their leaf came from. You could also do leaf rubbings or leaf prints, then add the leaves to a collage. Spider Web Wonders. Draw a spider, discussing its anatomy (head, abdomen, 8 eyes, 8 legs that attach to the “head”). Children create spiders with a variety of craft or snack materials. The math game is “how many legs”. The teacher holds up a sign saying 0, and asking what creatures have zero legs. After children guesses, turn over the card to show a picture of the answers. (Snake, worm, etc.) Then do 1, 2, 4, 6, 8, 14, 30+. A take home at Halloween time could be to check out Halloween decorations, and see how many of them get the spider anatomy wrong. Hiding in Plain Sight. Gather a collection of toy animals (stuffed or plastic). Begin with a matched pair, and hide one in plain sight before the children arrive. Then show them the matching animal animal and see if they can spot the hidden one in the room. Talk about how it was hiding in plain sight – for example, placed in front of a similar colored item it could blend into, or placed somewhere that’s visually very busy so it could “hide” in the clutter. Explain the basics of camouflage. Next, the teacher or some children “hide” more animals, either in the classroom or outdoors. BUT… they should be told to hide them in plain sight. Then take the other children out to search. Then, build camouflage collages: cut out photos of animals, have the child paste one onto paper, then surround it with tissue paper squares in the colors that would camouflage it. Play “freeze birds”, explaining that even when animals are camouflaged, they give themselves away if they move. The “hawk” closes his eyes while the “bluebirds” play. When you call out freeze, they freeze, and the hawk opens his eyes. If he sees anyone move, they become the hawk. That’s just a small sampling of ideas. For educators this book could provide a full ready-made nature curriculum for your class, or could provide lots of ideas you might sample as you build your own curriculum. For parents, there’s plenty of fun and easy ideas in here – you can try out any that seem fun to you. To learn more about nature play, click on these links “Recommended Daily Allowance of Outdoor Time“, Benefits of Outdoor Play, and Overcoming the Barriers to Outside Play. 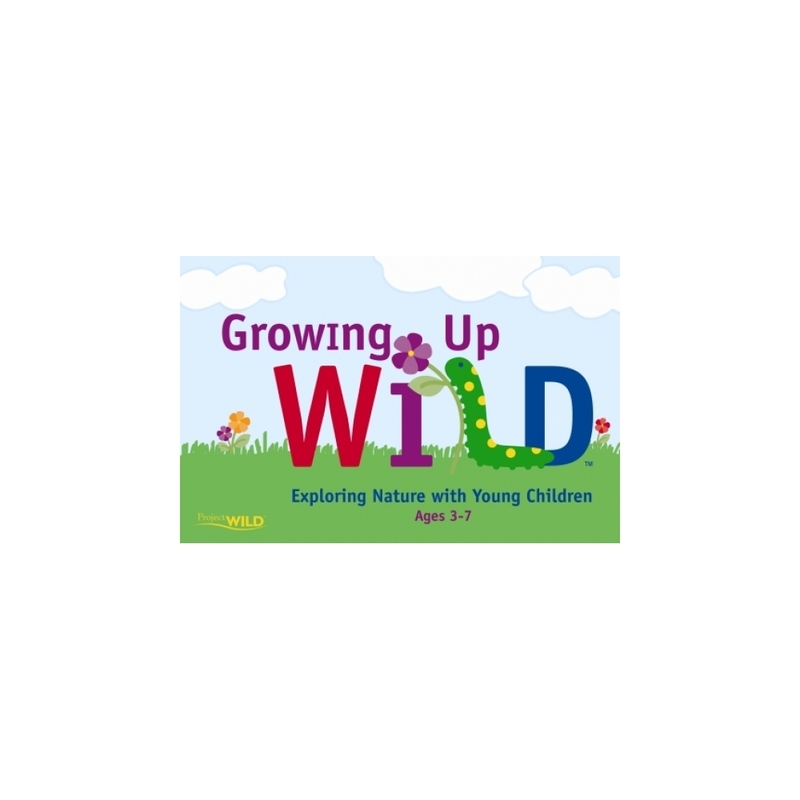 This entry was posted in Books and Resources, Inventors of Tomorrow series, Nature Activities and tagged book, curriculum, educators, nature, outdoors, preschool on June 25, 2015 by Janelle Durham.